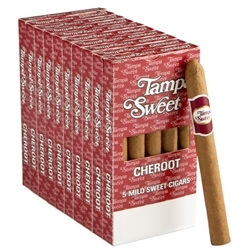 Tampa Sweet Cheroot cigars provide a rich, satisfying smoke. Filled with a blend of Colombian and Italian tobaccos which lends an exquisite sweetness to the flavor. Each Cheroot is held together in a crisp roll by a homogenized sheet which lets the burning play out steadily. These cigars have a natural wrapper that lends a smooth texture to the body of the cigar and emanates a wonderful aroma and long lasting aftertaste. Try Tampa Sweet Cheroot cigars today here at Smokers Discounts.